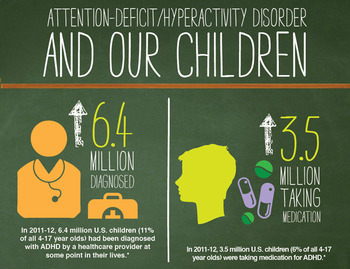 More than 1 in 10 children in the United States have ADHD. New statistics from the Centers from Disease Control and Prevention (CDC) show that 11 percent of the children ages 4 to 17 in the US have been diagnosed with Attention Deficit Hyperactivity Disorder, or ADHD. This is up 41 percent since 2003, when 7.8 percent had the diagnosis. 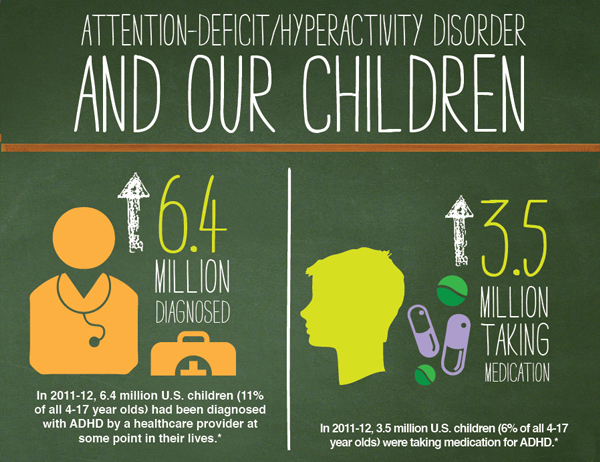 Some of that increase is that we are more aware of ADHD and are therefore diagnosing it more. (We are also diagnosing it early; half are diagnosed by the time they are 6 years old.) But some of that increase is real. The majority of the kids with ADHD (69 percent) are taking medications. While it's good that they are getting treatment, a study earlier this year showed that taking medications didn't necessarily help kids academically or any other way. Medications can help kids concentrate, but they can't pick what kids concentrate on. Behavioral therapy can make a difference, especially when kids get to learn the life skills they need to manage their ADHD, but not everybody gets therapy or life skills training. And life skills are what they need, because ADHD is not just a condition of childhood. Another study published this year showed that it often persists into adulthood, and people who had ADHD as children were more likely to suffer from other problems such as alcohol or drug abuse, anxiety, depression or other mental health problems. They are also more likely to try to commit suicide. I guess that's what's freaking me out about these statistics. This isn't just about a few more active and distracted kids who struggle in school and with friendships and with keeping out of trouble. This is about the adults those kids will grow into: adults who are likely to struggle in many ways too, and whose struggles are likely to affect those around them in just as many ways. Because there is collateral damage when it comes to ADHD. I watch it play out in families, in the stress it puts on parents and marriages and siblings. It plays out in classrooms, too: these numbers translate into at least two kids with ADHD in every classroom, which can affect everyone's learning. It costs our health care and educational system millions of dollars. Adults with ADHD, besides possibly being perhaps not the best spouses, parents or employees, can end up needing real resources to help them, and those resources cost money too. The ripple effects of 11 percent of children having ADHD could be staggering. More and more, it's becoming clear that ADHD is a public health problem--like obesity or heart disease or HIV. We will never succeed in tackling it if we don't start thinking of it that way, and give it real attention, thought and resources. But unlike with other public health problems, we don't really understand all its causes--or the best way to treat it. Which makes fighting it hard. It's not just a matter of eating healthy and getting exercise; ADHD is complex, and each person with it is different. That's why I'm feeling so upset about this report. When it comes to most public health problems, I know what to say as a doctor, community member and mother. When it comes to ADHD, I don't. I can help individual patients and families, but I don't know how to even begin to make a dent in the overall problem. That's what needs to change. We need to take this problem seriously, as seriously as we've taken cancer or asthma or influenza. This isn't a problem of a few badly-behaved kids; this is much bigger and more dangerous. We need to find better ways to prevent and treat it. There are lives that need saving. Let's not wait any longer. Let's get started.